Midtown is in desperate need of a lot of things, and good pizza is definitely at the top of that list. This is New York, bad pizza is unacceptable, and unfortunately we have a glut of it. I haven’t exactly been hiding my love for the sandwiches at Cer Te (55th btw. 5+6th), so to say I was excited about their “green” take-out pizzeria, Pizza by Cer Te (on 56th btw. Lex+Park) would be an understatement. I’d been studying the menu since it came out, particularly curious about the “bakers” and the “ciagels,” but since I was going for lunch I could only get the answer for one of these creations (ciagels are on the breakfast menu.) Having a low environmental impact is good and all (I’ll admit the plant walls are pretty cool) but we want awesome tasting pizza and we want it now! I was there to survey the scene and eat some pizza on opening day last Thursday. Though I looked at the toppings menu-all of the combinations sound delicious-I went with the standards: a Margherita slice and a Pomodoro Baker. If you don’t make a good regular slice, you’re pretty much out of my book no matter how many delicious toppings you pile on. The Margherita consists of fresh tomato sauce, covered with slices of fresh mozzarella; sadly the formerly high $2.50 price tag is average these days, so it’s tough to complain. And after the first bite the price didn’t even matter, I was in pizza heaven. The sauce is awesome, slightly acidic from the tomatoes, not too sweet, while the cheese is perfectly melted and very high quality-no rubbery mozzarella here. 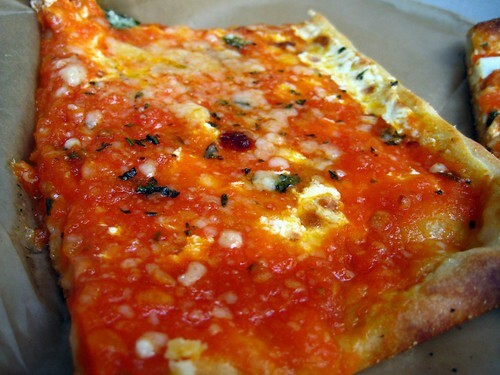 The crust has a good char and is strong enough to support the toppings without being too thick. I know it’s early but I’m tempted to nominate this as the best slice in Midtown, and from the comments last week, I’d say I’m not alone in this notion. The Bakers are apparently thin crust Sicilians with the cheese below the sauce, similar to Grandma slices (I dare say it is a Grandma slice?). But unlike most Grandmas I’ve had, this one was actually good. The crust is the same as the regular pie, crunchy with a bit of chewy inside, and strong. But like its direct opposite slice, the cheese and sauce won my over on this one. Basically for an extra 45¢ you are you getting your slice inverted and square-either way, it’s delicious. The quality of the products on both slices reminded me of high-brow pizza places that I love to eat at, but hate paying for. Now my lunching companion felt the need to buck the usual pizza system, and go for the vegan personal pie. Instead of sauce, there’s hummus and it’s topped with mushrooms and peppers, and from what she told me, it was pretty awesome- even if it is on the “healthy side”. Besides the vegan pizza (which my token office vegan was excited to hear about), they also offer a selection for our gluten-free Midtowners. At $9.75, getting a 10″ personal may be a bit too expensive for me, but for those of you with big appetites, this might be the way to go. As of today, they’ve started their delivery service with the same boundaries as the regular Cer Te. If any of you have tried the ciagels, let us know in the comments. One of the few high-brow pizza places in Midtown that offers by-the-slice. It’s environmentally friendly! Save the Earth by eating pizza! Where am I eating this? There’s no place to sit! They use herbs that they grow on their walls with NYC’s acid rain? What is this, California?! 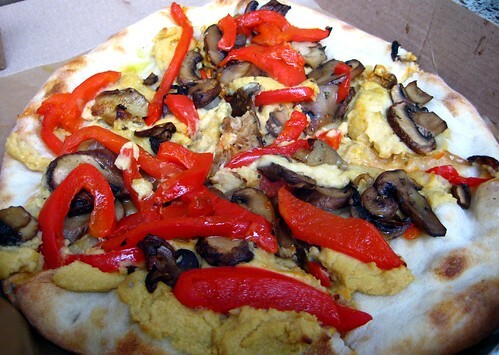 Vegan pizza is an abomination on all things good and holy. Posted by Blondie at 11:45 am, April 26th, 2010 under Pizza, Pizza by Cer Te. From “The -”: If you don’t want to pay over $2 for a slice in NYC, your options are severely limited! Are there any $2-and-under slices available besides the handful of 99-cent/$1 places? Also, what about Naples 45? I think that would still have to be a contender for best Midtown slice. can anyone try their tiramissu and let me know how it is..it looks so good. cannoli chips and dips too please, if possible. LOL. 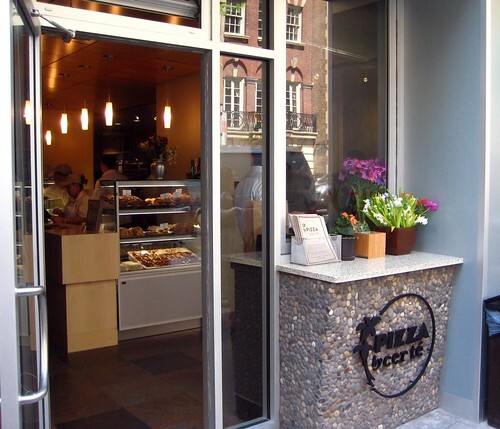 I did enjoy their brownie sample…as I always do at the regular Cer Te location. Also, Pizza by Cer Te might want to start labeling their items with prices. I’m sure plenty of people have kept asking them how much this is and that is. I heard it at least twice. I went on Friday and got 3 slices: Margherita, Pomodoro, Bianco as well as a Tiramissu. I can’t say that I was blown away by the slices. I loved the earthy taste that the truffle oil gave to the Bianco, however, the greens on top (maybe arugala)were shriveled up and crunchy. It’s possible that it was that way by design, but I didn’t care for it. Maybe it was because they reheated the slice. I don’t like when other places cook a traditional margherita pie with basil already on it. It should be added after it comes out of the oven. Otherwise, I was pretty full by the time I ate the tiramissu, but there was a lot of it and I enjoyed it. No real review, but it was something that I would definitely purchase again. One more thing…the cashier should tell people that after you order, you have to walk around the corner to pick up your food. The cashier did tell me to wait around the corner today…but not on last friday so I guess she learned. so you liked the tiramisu. great. can’t wait to try it. The cashier told me to wait around the corner on Friday and today. Maybe an arrow sign for the people not-in-the-know yet or when it slips her mind. I have similar sentiments of joer on the Pizza. It really hasn’t wow’ed me. Maybe I’m just a plain pizza or a meat-overload slice type of person especially if I’ve only taken a liking to the Godfather thus far. Nothing bad overall, I like their crispy crust, but just expect a lil more with their specialty slices since they carry a decent price tag. I also haven’t had the pleasure of eating it warmer and I’m only a few blocks away from the location. I could be wrong since I don’t frequent the regular slice joints, but isn’t Certe’s slices priced on par with the Ray’s, Famous Famiglia’s, etc? Ok, so Amadeus Pizza prices their 2 topping at $3.75. Ray’s prices one & two topping slices at $3.20 and $4.05. 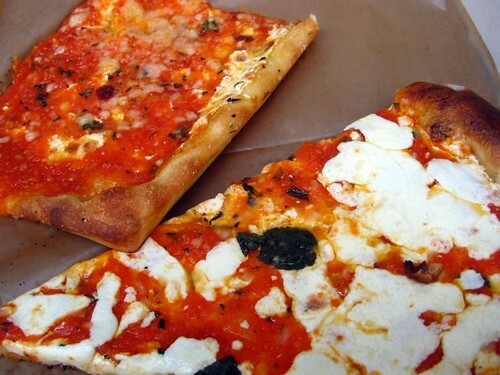 Even my sentimental favorite slice joint in NYC, Nino’s in the East Village, has their plain slice at $2.50. So yeah, Certe is priced on par across the board with the rest of the slice joints. LOL. Way to answer your own question. Cer Te is on par with pricing BUT I think you need to compare it with size, taste, and quality. 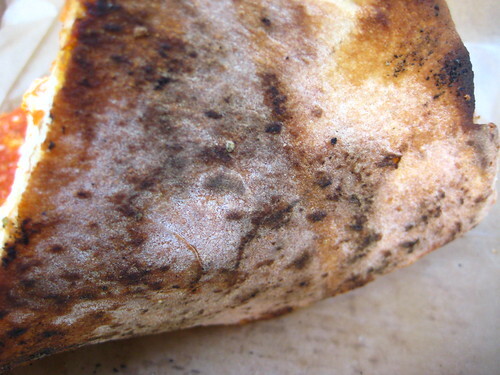 Although, Cer Te might have a seemingly have a slight advantage on quality – still should be tested by pizza lovers. And we defintiely all have our own individual preferences when it comes to pizza – whether it’s cheap, high-end, local or chain. Red Stone’s Margherita slice is 2.50. The Generosa (Everything) Slice is 5. I usually go for the Spicy Chicken and it’s around 4. Ray Bari’s Neopolitan slice is 2.80. And their meat monster slice is 6 (although I haven’t ordered it by the slice, only pie with friends). do you smell of sheep?